Pandya didn't play any Test on the tour but entertained the crowd during his short stint. Team India is on the cusp of history in Australia. Not surprisingly, there is more support to the visitors in the stands in the last Test which has been dominated by India from the word go. Regardless of the result in Sydney, they are going win the series which is why even the players are relaxed. It is evident with the way they have been having fun on the field. Hardik Pandya was also involved in one such incident when he was seen tapping his feet while fielding near the boundary line. 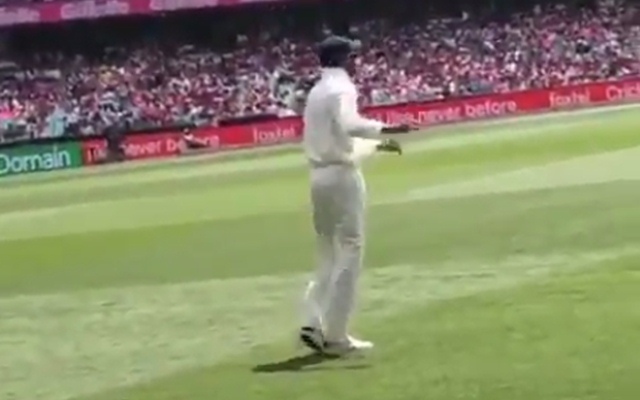 During the third day’s play at the SCG, when the whole stadium had turned Pink to pay tribute to Glenn McGrath‘s wife Jane McGrath, Hardik displayed his dancing skills. Bharat Army which constantly supports the Indian team on tours through their thick and thin was having a field day in the Stadium and were singing a song. At the same time, the star all-rounder tapped his feet on it which entertained the crowd. The official Twitter handle posted the video of the same showering praises on Hardik Pandya for his lovely gesture and inspiring them to support the Indian team more. The fourth day of the final Test saw only 25.3 overs being bowled at the SCG. However, even during this period, the Indian bowlers were capable enough to skittle Australia for 300 runs and gained a massive 322-run lead. With a lot of rain around, Virat Kohli decided to enforce the follow-on, the first for Australia at home in 30 years. In the second innings though only a couple of overs of play was possible as the hosts didn’t lose any wicket. Kuldeep Yadav was the star for the team as he registered his first five-wicket haul in Tests in Australia. He returned with the figures of 5/99 and kept the batsmen on the tenterhooks all the time.